Enoxaparin sodium is an anticoagulant medication (blood thinner). It is used to treat and prevent deep vein thrombosis (DVT) and pulmonary embolism (PE) including during pregnancy and following certain types of surgery. It is also used in those with acute coronary syndrome (ACS) and heart attacks. It is given by injection just under the skin or into a vein. Other uses include inside kidney dialysis machines. Common side effects include bleeding, fever, and swelling of the legs. Bleeding may be serious especially in those who are undergoing a spinal tap. Use during pregnancy appears to be safe for the baby. Enoxaparin is in the low molecular weight heparin family of medications. Enoxaparin was first made in 1981 and approved for medical use in 1993. It is on the World Health Organization's List of Essential Medicines, the most effective and safe medicines needed in a health system. 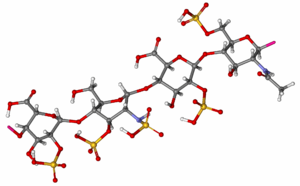 Enoxaparin is sold under several brand names and is available as a generic medication. The wholesale cost in the developing world is about US$1.90–10.80 per day. In the United States the wholesale cost is about $14.13 per day as of 2016. Enoxaparin is made from heparin. In 2016 it was the 295th most prescribed medication in the United States with more than a million prescriptions. Enoxaparin has predictable absorption, bioavailability, and distribution therefore monitoring is not typically done. However, there are instances where monitoring may be beneficial for special populations, for example individuals with kidney insufficiency or those that are obese. In this case, anti-Xa units can be measured and dosing adjusted accordingly. Protamine sulfate is less effective at reversing enoxaparin compared to heparin, with a maximum neutralization of approximately 60% of the anti-factor Xa effect. Enoxaparin is a FDA pregnancy category B drug which means enoxaparin is not expected to cause harm to an unborn baby when used during pregnancy. This statement is based on reproductive studies involving pregnant rats and rabbits. No birth defects or toxic effects to an unborn fetus due to enoxaparin were observed during these animals studies. However a human's response to enoxaparin might be different than that of a small animal, therefore enoxaparin should be used during pregnancy only if there is a definite need. Enoxaparin does not cross the placenta therefore it is unlikely an unborn baby would be exposed to it. Some fetal deaths have been reported by women who used enoxaparin during pregnancy, but it is unclear if enoxaparin caused these deaths. Pregnant woman on enoxaparin should be monitored on a regular basis for bleeding and/or "excessive anticoagulation" especially when the delivery date is approaching. The risk of hemorrhage is higher during delivery if the person is still using enoxaparin and this could endanger the life of the baby and/or the mother. The multiple-dose vials of the brand name enoxaparin (Lovenox) contain 15 mg benzyl alcohol per 1 mL as a preservative. Premature infants who have been given large amounts of benzyl alcohol (99–405 mg/kg/day) have experienced "gasping syndrome". Although enoxaparin is used to prevent blood clots it is necessary to remember that pregnancy alone can raise a woman's risk of clotting. The FDA issued a revision to the boxed warning for enoxaparin in October 2013. The revision recommends exercising caution regarding when spinal catheters are placed and removed in persons taking enoxaparin for spinal puncture or neuroaxial anesthesia. It may be necessary to delay anticoagulant dosing in these persons in order to decrease the risk for spinal or epidural hematomas, which can manifest as permanent or long-term paralysis. Persons at risk for hematomas may present with indwelling epidural catheters, concurrent use of medications that worsen bleeding states such as non-steroidal anti-inflammatory drugs (NSAIDs), or a past medical history of epidural or spinal punctures, spinal injury, or spinal deformations. The FDA recommends that at-risk persons be monitored for bleeding and neurological changes. Enoxaparin binds to and potentiates antithrombin (a circulating anticoagulant) to form a complex that irreversibly inactivates clotting factor Xa. It has less activity against factor IIa (thrombin) compared to unfractionated heparin (UFH) due to its low molecular weight. Metabolism: Enoxaparin is metabolized in the liver into low molecular weight species by either or both desulfation and depolymerization. Elimination: A single dose of a subcutaneous injection of enoxaparin has an elimination half-life of 4.5 hours. Approximately 10%-40% of the active and inactive fragments from a single dose are excreted by the kidneys. Dose adjustments based on kidney function are necessary in persons with reduced kidney function. Enoxaparin belongs to the class of drugs known as low molecular weight heparins. Other drugs in this class include dalteparin, fondaparinux and tinzaparin. ^ a b c d e f g h i j "Enoxaparin Sodium". The American Society of Health-System Pharmacists. Archived from the original on 21 December 2016. Retrieved 8 December 2016. ^ "Clexane Forte Syringes - Summary of Product Characteristics (SPC) - (eMC)". www.medicines.org.uk. 6 August 2015. Archived from the original on 20 December 2016. Retrieved 15 December 2016. ^ a b Network, Northern Neonatal (2008). Neonatal Formulary: Drug Use in Pregnancy and the First Year of Life. John Wiley & Sons. p. 96. ISBN 9780470750353. Archived from the original on 2016-12-20. ^ "Enoxaparin". International Drug Price Indicator Guide. Retrieved 8 December 2016. ^ "NADAC as of 2016-12-07 | Data.Medicaid.gov". Centers for Medicare and Medicaid Services. Archived from the original on 21 December 2016. Retrieved 15 December 2016. ^ Gershanik, Juan; Boecler, Betty; Ensley, Harry; McCloskey, Sharon; George, William (1982-11-25). "The Gasping Syndrome and Benzyl Alcohol Poisoning". New England Journal of Medicine. 307 (22): 1384–1388. doi:10.1056/NEJM198211253072206. ISSN 0028-4793. PMID 7133084. ^ "Reducing Thrombotic Complications in the Perioperative Setti... : Anesthesia & Analgesia" (PDF). LWW. Retrieved 2015-11-05. ^ a b c d e f g h i "DailyMed - ENOXAPARIN SODIUM- enoxaparin sodium injection". dailymed.nlm.nih.gov. Archived from the original on 2015-10-19. Retrieved 2015-11-05. ^ a b Research, Center for Drug Evaluation and. "Drug Safety and Availability - FDA Drug Safety Communication: Updated recommendations to decrease risk of spinal column bleeding and paralysis in patients on low molecular weight heparins". www.fda.gov. Archived from the original on 2015-10-30. Retrieved 2015-11-05. ^ Commissioner, Office of the. "Safety Information - Lovenox (enoxaparin sodium) injection". www.fda.gov. Archived from the original on 2016-03-04. Retrieved 2015-11-05. ^ Alldredge, Brian; Corelli, Robin; Ernst, Michael; Guglielmo, B. Joseph; Jacobson, Pamela; Kradjan, Wayne; Williams, Bradley. Koda-Kimble and Young's Applied Therapeutics: The Clinical Use of Drugs (Tenth ed.). pp. 347–348. ISBN 978-1-60913-713-7. ^ Trevor, Anthony J., Bertram G. Katzung, and Susan B. Masters. Basic & clinical pharmacology. McGraw-Hill Medical, 2012. ^ "LowMolecularWeightHeparins". livertox.nih.gov. Archived from the original on 2015-08-28. Retrieved 2015-11-05. This page was last edited on 27 February 2019, at 04:50 (UTC).